GALION — Three area chambers of commerce are combining efforts for a business expo April 18 in Bucyrus. 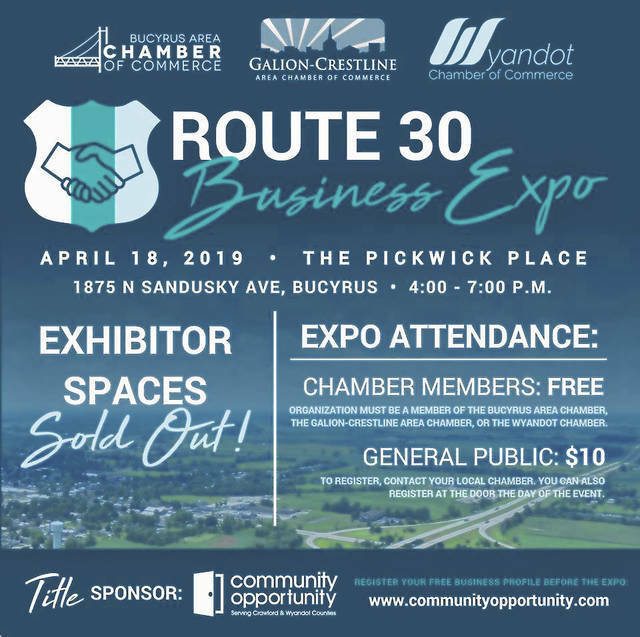 The Galion-Crestline Area, Bucyrus Area, and Wyandot chambers will have the first Route 30 Business Expo from 4-7 p.m. on April 18 at Pickwick Place in Bucyrus. The Route 30 Business Expo will showcase nearly 50 community businesses and organizations, offering ample time for business-to-business networking across a tri-county area. Sponsors in luce Community Opportunity (Title); A-1 Printing; Avita Health Systems; iHeartMedia; Mizick Miller; Pickwick Place; SCORE; and WMFD. Pickwick Place is at 1875 N. Sandusky Ave. Light appetizers will be provided, as well as complimentary beverages from White Shutter Winery and the Eighteen-O-Three Taproom. Chamber members will be admitted free. The cost for others is $10. For more information on the Route 30 Business Expo, visit www.route30expo.com.